I wish I could tell you that I’ve tried it all but one of the things that really gets my goat are diet fads. All manner of freedivers-at various levels of experience-have imparted their dietary ‘wisdom’ to me at one time or another. They’ve told me to eat raw food, eat only organic, eat lots of carbs, eat almost nothing, drink vinegar, drink herbal tea, drink urine (I’m not kidding here! ), eat low acid, eat paleo, drink creatine, drink endurox, blah, blah, blah. How can one make a decision about what to eat when the information they get is diluted by a billion different choice. 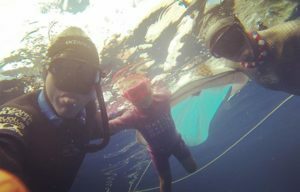 Do you know how much freediving you would have to do to adequately try each of the diets mentioned above and attempt to qualify what works best? 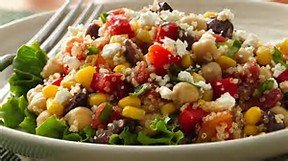 Quinoa salad does the trick! AM: Breakfast then dive (usually three hours in water). Afternoon: Lunch then put Ani down for a nap, two to three hours, (She was exhausted after training. That’s right, Ani made it out to the training lines along side us all except two days per week, when she was in school.) and begin computer work. Typical training day with Ren, Ani and Ashley Chapman. Evening: Socialize with buddies (you know who you are!) and/or run errands then supper and bed. Breakfast: One full glass of water after waking to hydrate and stave off immediate hunger. Light breakfast of either chocolate oatmeal- Roatan has amazing organic, unsweetened cacao powder -or cereal with a bit of cashew milk. Another full glass of water to make sure hydration is sufficient before diving. During Training: Only enough water to stay hydrated. Not even 1000 mils between the two of us during the three hour period. Recovery: I am NOT an advocate of supplements. I believe that nature or the grocery store have exactly what we need to stay healthy and strong without taxing our organs. I also believe that by eating roundly without supplements you’ll have a much more thorough understanding of when you are fatigued, injured or just plain awesome. But when we get home from our dives, before lunch is ready, we needed something for the system. You will all LOVE our recovery drink of choice…after a full glass of water…a light beer! Ren and I would split an ice cold, weak (not much alcohol content) lager right after putting our dive gear away. The beer supplied us with immediate calories, took away the hunger, and just made us happy. Otherwise we would either buy-from Escondido-or make a shake called the Nutty Monkey. We still make these for Ani in the mornings. Two bananas, one scoop of natural peanut butter, organic cacao powder (we are obsessed) and cashew milk. Blend it all up and you have a supremely delicious shake that is also filling. Lunch: Salad always made from either sprouts we grow on Jade or kale. A nice full salad usually with a protein on top to aid in recovery (greek yogurt is a favorite in our house, canned fish, flaxseed). We love the salads because they never made us too full or groggy yet they always filled us up. Also, we could use the “color diet” to make sure we were getting proper nutrition. Tomatoes, avocados, sweet potato, eggplant, lots of olive oil…DONE! Supper: Eat light. At the Caribbean Cup this year I really began to understand fully how every little thing that goes into your body has an affect on your ability to dive. I was pushing my limits in the no fins category and could feel the changes in my system more acutely once at the brink of my physical capacity. I learned first hand that diving your best does not happen when you eat heavy the night before. If you do not agree with this I would contend that you are not diving at your physical limitations (not to include equalization limits). Eating light, just enough to be satisfied and not hungry is best for optimal performance. Freedivers do not need the same kind of slow release energy stores that long distance athletes might. We are essential sprinters and should model our diets as such. Complex carbs such as quinoa, sweet potato or lentils are nice when paired with vegetables of various colors. Just like sprinters in other sports, freedivers benefit from bodies with lower fat content so add healthy fats such as avocados, nuts and olive oil. Trust me here, I ate a half a chicken one night before a big dive. I had not been eating much meat at all and was used to eating light suppers. The next day, the blackout of my life! Double shakas means the diet worked! Feel free to learn from my mistakes! 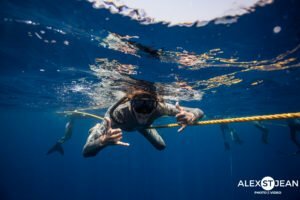 The advice above is what worked for me and will have to be adjusted for freedivers who are spearing all day as opposed to competitively diving. I would contend that the diet for that kind of activity would best be mirrored by an endurance athlete as opposed to a sprinter. Enjoy trying these things out for yourselves and never dive alone!